Let Our Graphics Department make the one of kind Club Logo your looking for. Graphics can be made almost any color you like. Made of high grade, long lasting outdoor sign vinyl. 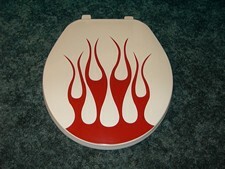 Many different pre made and custom styles to choose from. E-mail us with an idea or a sketch of the design you would like. Then we will e-mail you back, with the proof and the price. Check out some cool ideas on our examples page. for installing vinyl graphics .This is our own recipe, it seems to allow graphics to slide around better and then dry faster than others out there. And it smells good too. This works much better than the old soap and water trick. There is enough fluid to install many graphics in this bottle, it doesn't take much to do the job. Stop buying the same old graphics that everyone has. Let Our Graphics Department make the one of kind graphic your looking for. 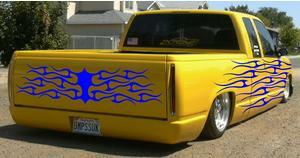 E-mail us with a picture of the side of your car and a sketch of the design you would like. Then we will e-mail you back, with the proof and the price. Complete seats come in white only with your choice of color for the graphic. on your windshield or back window. Made of high quality outdoor sign vinyl so it's made to last for many years. Tell everyone what you want to see. Stop using those old cardboard signs that you made with a black magic marker, and step up to the new tough, reusable style. These signs are made of high quality solid core pvc sign board with customizable outdoor sign vinyl lettering on them. Use them at parties, on the cruz, at bikini/ (skin to win) contest, anywhere you want. Use them over and over again. These signs can also be made two sided, just flip it over to say "Show Me" something else on the back. Show boards are a must for any good display. Nobody knows about all the hard work you put into your mini unless you tell them. Judges also appreciate it when they see them, because it helps them do there job much easier, faster, and more complete. We can make them cool, (just the way you like them).